Each tablet contains Amoxicillin Trihydrate USP equivalent to 250 mg of Amoxicillin. Specification: USP List of excipients: Mannitol DC, Crospovidone, Aspartame, Silicon Dioxide Colloidal, Strawberry Dry Flavor, Talc, Pigment Red No. 3 FDC E 127, Magnesium Stearate. AMOXSAN Dispersible Tablet is a broad spectrum antibiotic indicated for the treatment of commonly occurring bacterial infections such a : • Upper respiratory tract infections e.g., tonsillitis, sinusitis, otitis media. Streptococcus faecalis, Streptococcus pneumoniae, Streptococcus pyogenes, Streptococcus viridans, penicillin-sensitive Staphylococcus aureus, Coryne-bacterium species, Bacillus anthracis, Listeria monocytogenes. Anaerobes: Clostridium species. Gram-negave Aerobes: Haemophilus influenza, Eschericia coli, Proteus mirabilis, Salmonella species, Shigella species, Bordetella pertussis, Brucella species, Neisseria gonorrhoeae, Neisseria meningitides, Pasteurella septica, Vibrio cholera. Amoxicillin is susceptible to degradation by betalactamase and therefore the spectrum of activity of ®A MOXSAN does not include organisms which produce these enzymes, including resistant staphylococci and all strains of Pseudomonas, Klebsiella and Enterobacter. • Adults and children over 40 kg: for severe infections, 875 mg every 12 hours or 500 mg three times daily. • Gonorrhoea: single 3 g dose. • Children's dosage (Children under 40 kg) Standard children's dosage: 125 mg three times daily, increasing to 250 mg three times daily for more severe infections. Note: Moderate infection are certain infection without complication such as septicemia or bactericemia. Severe infection are certain infection with complication such as septicemia or bactericemia. - H. influenzae, specifically meningeal infections. - Gram-negative bacteria causing bacteremia, meningitis. It should not be used to treat the hepatobilier and gonorrhoea. - Adult : 250 - 500 mg, 3 - 4 times daily. - Children : 50 mg/kg/day divided into 3 - 4 doses. - Premature infants : 25 mg/kg/day divided into 4 doses. - Newborn infants less than 2 weeks : 25 mg/kg/day divided into 4 doses. - It should be used only for infections caused by known microorganisms. 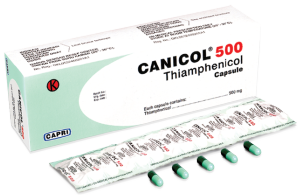 - In administration of Thiamphenicol for a long time should be followed by periodic test of hematologic. - In patients with renal impairment may require adjustment in dosage. - Duration of treatment should not be excessed the require of limit time. - It should be used with caution in pregnant and lactating women because - Thiamphenicol readily crosses the placenta and excreted in breast milk. - Thiampenicol should be used with caution in the newborn (less than 2 weeks) and premature infants to avoid the Gray syndrome. The use of Thiamphenicol for a long time may result in growth of nonsusceptible microorganism including fungi and bacterial. Box of 1 vial @ 0.5 g.
Box of 1 vial @ 1 g.
Meropenem Trihydrate equivalent to 0.5 g of Anhydrous Meropenem. Meropenem Trihydrate equivalent to 1 g of Anhydrous Meropenem. - Empiric treatment for presumed infections in adults patients with febrile neutropenia, used as monotherapy or in combination with antiviral or antifungal agents. CAPRENEM® is efficacious alone or in combination with other antimicrobial agents in the treatment of polymicrobial infections. There is no experience in pediatric patients with neutropenia or primary or secondary immunodeficiency. The dosage and duration of therapy should be established depending on the type and severity of infection and the condition of the patient. - Pneumonia, UTI, gynecological infections such as endometritis, skin and skin structure infections: 500 mg i.v. 8 hourly. - Nosocomial pneumonia, peritonitis, septicemia, presumed infections in neutropenic patients: 1 g i.v. 8 hourly. - Meningitis: 2 g i.v. 8 hourly. - As with other antibiotics, particular caution is recommended in using Meropenem as monotherapy in critically ill patients with known or suspected caused by Pseudomonas aeruginosa lower respiratory tract infection. Regular sensitivity testing is recommended when treating Pseudomonas aeruginosa infection. Meropenem is cleared by hemodialysis. If continuous treatment with CAPRENEM® is necessary, it is recommended that the unit dose (based on the type and severity of infection) be administered at the completion of the hemodialysis procedure to restore therapeutically effective plasma concentrations. There is no experience in the use of CAPRENEM® in patients under peritoneal dialysis. No dosage adjustment is necessary in patients with hepatic insufficiency (see precautions). No dosage adjustment is required for the elderly with normal renal function or creatinine clearance values above 50 mL/minute. - Children > 3 months up to 12 years: recommended dose is 10 - 20 mg/kg body weight 8 hourly (depending on the type and severity of infection, susceptibility of the pathogen and the condition of the patient). - Children > 50 kg body weight: adults dosage should be used. - Meningitis: recommended dose is 40 mg/kg body weight 8 hourly. - There is no experience in children with renal impairment. - CAPRENEM® should not be mixed with or added to other drugs. 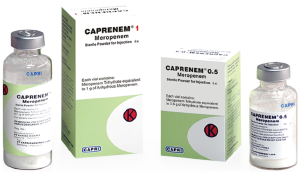 - CAPRENEM® is compatible with some infusion fluids as shown in the table of stability. - It should be used with cautions in patients with hypersensitivity to ?-lactam antibiotics. If an allergic reaction to Meropenem occurs, the drug should be discontinued. - In patients with hepatic disease, serum hepatic levels should be monitored. - It is not recommended for use in infections caused by methicillin resistant Staphylococci. - It is important to consider the diagnosis of pseudomembran colitis in the case of patients who develop diarrhea in association with the use of CAPRENEM®. Although studies indicate that a toxin produced by Clostridium difficile is one of the main causes antibiotic-associated colitis, other causes should be considered. - Caution should be given when CAPRENEM® is administered concomitantly with and potentially nephrotoxic drug. - No data are available, but it should be anticipated that CAPRENEM® may affect the ability to drive and use machines. - Pediatric use: Efficacy and tolerability in infants under 3 months have not been established, therefore CAPRENEM® is not recommended for use below 3 months infants. There is no experience in children with altered hepatic or renal function. - Pregnancy and lactation: The safety of CAPRENEM® in pregnancy has not been evaluated. CAPRENEM® should not be used in pregnancy and lactation unless the potential benefit justifies the potential risk to the fetus. In every case, it should be used under the direct supervision of the physician. Cefepime Hydrochloride Monohydrate equivalent to 1 g of Cefepime. Inactive Ingredient : L-Arginine as a buffer. CAPRIFIM® is indicated in the treatment of infections listed below when caused by susceptible bacteria. - Lower respiratory tract infections, including pneumonia and bronchopneumonia. - Complicated upper (pyelonephritis) and lower urinary tract infections. - Skin and skin structure infections. - Intra-abdominal infections, including peritonitis and biliary tract infections. - Severe or complicated gynecological infections. - Empiric treatment in febrile neutropenia. Culture and susceptibility studies should be performed when appropriate to determine susceptibility of the causative organisms to CAPRIFIM®. Empiric therapy with CAPRIFIM® may be instituted before result of susceptible studies are known; however, once these result become available, antibiotic treatment should be adjusted accordingly. The recommended adults and pediatric dosage and routes of administration are outlined in the following table. CAPRIFIM® should be administered intravenaously over approximately 30 minutes. Pediatric patients (2 months - < 16 years) with body weight up to 40 kg. Urinary tract infections, skin and skin structure infections, pneumonia, and as empiric therapy for febrile neutropenia patients: 50 mg/kg body weight/dose, 12 hourly for 7 to 10 days. Febrile neutropenia patients: 50 mg/kg body weight/dose, 8 hourly for 7 to 10 days. Maximum dose: should not exceed the recommended adult dose. For intravenous infusion, constitute the 1 g vial and add 10 ml of compatible IV diluents. The resulting solution should be administered over approximately 30 minutes. During infusion of a solution containing Cefepime, it is desirable to discontinue the other solution. For intramuscular administration, constitute the 1 g vial and add 2.4 mL of compatible IM diluents, with one of the following diluents: Sterile water for injection, 0.9% Sodium chloride, 5% Dextrose, 0.5% or 1.0% Lidocaine hydrochloride, or sterile bacteriostatic water for injection with parabens or benzyl alcohol (See Table 2). IM use of CAPRIFIM® should be limited for patients with mild to moderate uncomplicated or complicated urinary tract infections caused by E. coli. To reconstitute, add compatible diluents and then shake until a clear solution obtained. Reconstituted solution of CAPRIFIM® is stable for 24 hours at temperature (15 - 25 C) or for 7 days under refrigeration (2 - 8 C). Discard any unused solutions after these periods. - In patients with impaired renal function, such as reduction of urinary output because of renal insufficiency (creatinine clearance =50 ml/min) or other conditions that may compromise renal function, the dosage of CAPRIFIM® should be adjusted to compensate for the slower rate of renal elimination because high and prolonged serum antibiotic concentrations can occur from usual dosage in patients with renal insufficiency. - Antibiotics should be administered with caution to any patient who has demonstrated some form of allergy, particularly to drugs. If an allergic reaction occurs, discontinue the drug and treat the patient appropriately. Serious hypersensitivity reactions may require epinephrine and other supportive therapy. - Pseudomembranous colitis has been reported with virtually all broad-spectrum antibiotics, including Cefepime. Therefore, it is important to consider this diagnosis in patients who develop diarrhea in association with the use of antibiotics. Mild cases of colitis may respond to drug discontinuation alone; moderate to severe cases may require more elaborate management. - Renal function should be carefully monitored if drugs with nephrotoxi potential e.g. aminoglycosides and potent diuretics, are administered with CAPRIFIM®. - As with other antibiotics, use of CAPRIFIM® may result in overgrowth of nonsusceptible organisms. If superinfection occurs during therapy, appropriate measures should be taken. 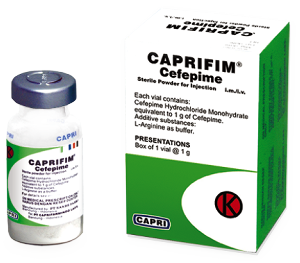 - Caution should be made when Cefepime is administered to pregnant women or nursing mothers. Because elderly patients are more likely to have decreased renal function, care should be taken in dose selection and renal function should be monitored. Box of 1 vial @ 1 g and 1 ampoule of water for injection @ 10 ml. Cefpirome Sulphate equivalent to 1 g Cefpirome. - Lower respiratory tract infections (bronchopneumonia & lobar pneumonia). - Skin and soft tissue infections (cellulitis, skin abscess and wound - infections). - Infections in neutropenic (except those caused by Pseudomonas aeruginosa) and immunocompromised patients. - Severe infections in intensive care patients. 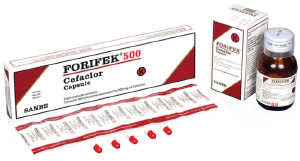 CAPROCEF® is to be used by the parenteral route, the dosage, mode of administration and duration of treatment depend upon the severity of the infection, sensitivity of the pathogens, condition of the patient and renal function. For urinary tract,skin and soft tissue infections, the unit dose may be increased to 2 g in very severe cases. No dose adjustment is required unless renal impairment is present. There is insufficient evidence on which to base an appropriate dosage regimen in children under 12 years of age. Therefore, CAPROCEF® is not recommended for this age group. - Hold the vial in an upright position. Remove approximately 10 mL air from the vial. - Add recommended volume of solvent slowly, hold the syringe plunger tightly. After completion, remove the needle. Shake to obtain a clear solution. As the antibiotic dissolves carbon dioxide is released causing frothing which clear quickly. - A high pressure inside the vial will be developed. Depress the syringe plunger fully and hold the plunger tightly. Insert the needle to the upright vial to the neck and withdrawal approximately 10 mL of gas. - Invert the vial. With a syringe plunger fully depressed, insert the needle keeping it within solution. The pressure aids withdrawal of the solution. - Bubble of carbondioxide in syringe clear quickly on tapping. As there are carbondioxide, smaller bubbles can be injected without ill effect. CAPROCEF® is given by intravenous injection over 3 to 5 minutes or infusion over 20 to 30 minutes. - Should be used with caution in patient with penicillin sensitive history, because cross-sensitivity may occurs. - Monitoring the renal function if Cefpirome administered concomitant with aminoglycosides or loop diuretic drugs. - Should not be used during pregnancy and breast feeding because in vitro studies have shown that Cefpirome crosses the human placenta. 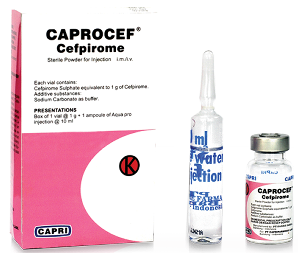 Cefpirome is also excreted in breast milk, either Cefpirome treatment should be discontinued or breast feeding stopped. - Safety using for children not known yet. - For the treatment exceed 10 days, the blood count should be taken and if neutropenia occur, the therapy should be discontinued. - In several cases, severe and persistent diarrhea has been observed during and after treatment with antibiotics of several different classes. This may be the symptom of pseudomembranous colitis (in most cases due to Clostridium difficile) which may be fatal. This is rare complication with cephalosporins. Once pseudomembranous colitis is suspected as the diagnosis, confirmed by sigmoidoscopy, Cefpirome therapy must be discontinued immediately and specific antibiotic therapy must be started. Products which may cause faecal stasis arecontra-indicated. Box of 5 strips @ 6 caplets. Amoxicillin Trihydrate equivalent to 500 mg of Amoxicillin and Clavulanate Potassium equivalent to 125 mg of Clavulanic Acid. Amoxicillin Trihydrate equivalent to 125 mg of Amoxicillin and Clavulanate Potassium equivalent to 31.25 mg of Clavulanic Acid. Amoxicillin Trihydrate equivalent to 250 mg of Amoxicillin and Clavulanate Potassium equivalent to 62.5 mg of Clavulanic Acid. - Upper respiratory tract infections e.g. tonsillitis, sinusitis, otitis media. - Lower respiratory tract infections e.g. acute and chronic bronchitis, lobar and bronchopneumonia. - Genito-urinary tract infections e.g. urethritis, cystitis, pyelonephritis. - Skin and soft tissue infections e.g. abscesses, cellulitis, boils. - Bone and joint infections e.g. osteomyelitis. - Dental infections e.g. dentoalveolar abscess. - Other infections e.g. septic abortion, purperal sepsis, intraabdominal sepsis. To minimize potential gastrointestinal intolerance, administer at the start of a meal. Treatment should not be extended beyond 14 days without review by a physician. - In mild to moderate infections : 1 caplet 250/125 mg, 3 times daily. - In severe infections : 1 caplet 500/125 mg, 3 times daily. - Dental infections : 1 caplet 250/125 mg, 3 times daily for 5 days. The usual recommended daily dosage is 25 mg/kg/day of body weight in the divided doses 8 hourly. - Mild impairment (creatinine clearance > 30 ml/min) : not change in dosage. - Moderate impairment (creatinine clearance 10 - 30 ml/min) : 1 tablet 250/125 mg or 1 caplet 500/125 mg 12 hourly. - Severe impairment (creatinine clearance < 10 ml/min) : not more than 1 tablet 250/125 mg 12 hourly. < 1 year (7.5 kg) : 2.5 ml, 3 times daily. 1 - 6 years (10 - 18 kg) : 5 ml, 3 times daily. > 6 years (18 - 40 kg) : 5 ml, 3 times daily. In more serious infections the dosage may be increased up to 50 mg/kg/day in divided dose 8 hourly. - Cautiously in patients with severe hepatic impairment. - In patients with moderate or severe renal impairment, dosage should be adjusted as recommended in the DOSAGES section. - Not recommended to pregnant and nursing mother except on medical recommendation. - In high dose or prolonged administration may induce superinfection (caused by Enterobacter, Pseudomonas, S. aureus, Candida) primarily in gastrointestinal tract. Box of 3 strips @ 10 capsules. Box of bottle containing dry syrup to be dispersed with drinking water up to 30 mL. Cefixime Trihydrate equivalent to 100 mg of Cefixime. - Uncomplicated urinary tract infections caused by Escherichia coli and Proteus mirabilis. - Upper respiratory tract infections, e.g. otitis media,pharyngitis and tonsillitis. - Lower respiratory-tract infections, e.g. acute bronchitis and acute exacerbations of chronic bronchitis. - Usual dose: 50 - 100 mg, twice daily. - Patients with impaired renal function require dosage modification depending on the degree of impairment. - Patients with creatinine clearance > 60 mL/minute: Standard dosage. - Patients with creatinine clearance between 21-60 mL/minute: 75% of the standard dosage. - Patients with creatinine clearance < 20 mL/minute: 50% of standard dosage. - For uncomplicated gonorrhoeae, a single dose of 400 mg Cefixime may be given. - Body weight > 30 kg, its recommended to use the daily dose: 50 - 100 mg of Cefixime, twice daily. - Body weight < 30 kg: 1.5 - 3 mg/kg body weight daily, administered in divided doses, twice daily. - For more severe or intractable infections, the dosage may be increased up to 6 mg/kg body weight daily, administered in divided doses, twice daily. In the children, otitis media should be treated with suspension, suspension should not be substituted. - Dosage may be appropriated according to the age, body weight and condition of the patients. - In case of overdosage, gastric lavage may be indicated, because there is no specific antidote exists. Cefixime is not removed in significant quantities from circulation by hemodialysis or peritoneal dialysis. Pour 10 mL of drinking water, shake for 30 seconds, pours futher 10 mL of drinking water, shake again to make homogenous suspension. After reconstitution, the suspension is stable fo 7 days at room temperature (25 - 30C). Shake well before use. - The dose should be adjusted in patients with impaired renal function. It should be used in pregnant and nursing women only if clearly necessary. - Safety and effectiveness of the drug in children under 6 months have not been established. - It should be given with caution to penicillin sensitive patients. - It should be carefully administered to the patients who have such personal or family allergic history as bronchial asthma, rash or urticaria. - Urinary tract infections, including prostatitis. - Urethritis and cervicitis gonorrhoeae. - Gastro-intestinal infections, including typhoid fever caused by Salmonella typhi. The efficacy of Ciprofloxacin in the eradication of the chronic thyphoid carrier state has not been demonstrated. Respiratory tract infections, except pneumonia caused by Streptococcus pneumoniae. - Mild/moderate urinary tract infections : 250 mg twice daily. - Severe urinary tract infections : 500 mg twice daily. - Mild/moderate respiratory, bone, joint, skin, soft tissue infections : 250 to 500 mg twice daily. 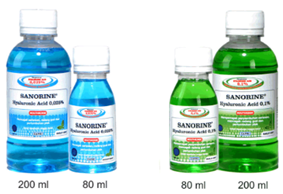 - Severe respiratory, bone, joint, skin, soft tissue infections : 500 to 750 mg twice daily. - Chronic prostatitis : 500 mg twice daily. - Gastrointestinal infections : 500 mg twice daily. - Acute gonorrhoea : a single dose of 250 mg.
- To achieve the adequate dose in acute osteomyelitis, dose not less than 750 mg twice daily. Nausea, vomiting, diarrhoea, gastro-intestinal disturbance, dyspepsia, abdominal pain, flatulence, anorexia, dysphagia. Consult to medical immediately if severe diarrhea occur or persistent during or after treatment, because this symptoms may cover the seriously disorders (pseudomembranous colitis) that need immediately action. 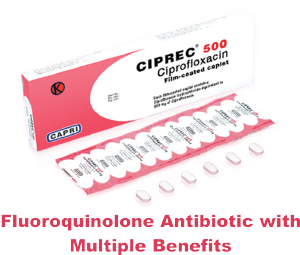 If these occur, administration of Ciprofloxacin should be discontinued and change with other suitable drugs (ex. Vancomycin per oral, 250 mg tablet, 4 times daily). The inhibitor peristalsis drugs are contra-indicated to Ciprofloxacin. Dizziness, headache, weakness, insomia, agitation, tremor. Very rarely : peripheral paralgesia, sweating, seizure, anxiety, nightmares, confusion, depression, hallucinations, impaired taste and smell, disturbed vision (e.g. double vision, change in color perception. Those reactions occurred after taking Ciprofloxacin for the first time. In this case, Ciprofloxacin should be discontinued and consult to medical immediately. Skin reactions, e.g. rash, pruritus, drugs fever. Anaphylactic / anaphylactoid reactions (e.g. edema of the face, vascular and larynx, severe dyspnea to dangerous shock). In this case, treatment with Ciprofloxacin should be discontinued, medical emergency action (ex. shock treatment) should be done immediately. Interstitial nephritis, renal failure, transient renal failure, polyuria, urinary retention, urethral bleeding, vaginitis and acidosis. Hepatitis, very rarely : liver disorders including hepatic necrosis. Rarely : tachycardia, palpitation, atrial flutter, ventricular ectopy, syncope, hypertension, angina pectoris, myocardial infarction, cardiopulmonary arrest, cerebral thrombosis, rash of face, migraine. Rarely : joint pain, malaise, musculoskeletal pain, tendovaginitis, mild photosensitivity, tinnitus, impairment of hearing particularly at high frequencies, epistaxis, laryngeal or pulmonary edema, hemoptysis, dyspnea, bronchospasm, pulmonary embolism. Eosinophilia, leucopenia, leucocytosis, anemia, granulocytopenia. Very rarely : thrombocytopenia, thrombocytosis, altered prothrombin levels. Plasma levels of transaminase and alkaly phosphatase may increase temporary; cholestic icterus may occur particularly in patients who disorder experienced; increase of urea, creatinine & bilirubin levels transiently; hyperglycemia; in certain case : crystalluria and hematuria. - Complicated urinary tract infection including mild to moderate pyelonephritis. - Uncomplicated skin and skin structure infections (mild to moderate). - Levofloxacin i.v. is only given to the patients who are unable to tolerate the oral dosage form. Common dose are 250 - 500 mg once daily (every 24 hour) in patients with normal renal functions (creatinine clearance > 80 mL/minute). Duration of administration between 7 - 14 days (depends on the level of infection). - If hypersensitivity reactions (skin rash, hives or other skin reactions, a rapid heartbeat, difficulty in swallowing or breathing, swelling of the lips, tongue, face, tightness of the throat, hoarseness) or other symptoms of allergy occur, the drug should be discontinued. - Diabetic patients which being treated with insulin or an oral antidiabetic agent and hypoglycemic reaction occurs, they should discontinue Levofloxacin and consult a physician. - Should be used with caution in any patient with a known or suspected central nervous system disorder that may predispose to seizures or lower the seizure threshold (e.g. severe cerebral arteriosclerosis, epilepsy) or in the presence of other risk factors that may predispose to seizures or lower the seizures threshold. - Convulsion and toxic psychoses have been reported in patients receiving quinolones (including Levofloxacin). Quinolones may also cause increase intracranial pressure and central nervous system stimulation which may lead to restlessness, lightheadedness, tremors, hallucinations, depression, paranoia and nightmares. If these reactions occur, the drug should be discontinued. - Serious and fatal hypersensitivity reactions often occur following the first dose. Some reactions have been accompanied by urticaria, itching and other serious skin reactions, dyspnea, respiratory obstruction, angioedema, hypotension, shock and cardiovascular collapse. The drug should be discontinued at the first appearance of a skin rash or any other sign of hypersensitivity. - Treatment with antibacterial agents (including Levofloxacin) alters the normal flora of the colon and may cause overgrowth of clostridia. Studies indicate that a toxin produced by Clostridium difficile is one primary cause of colitis. - Pseudomembranous colitis has been reported with nearly all antibacterial agents (including Levofloxacin), and may range in severity from mild to life threatening. Therefore, it is importantto consider this diagnosis in patients who present with diarrhea subsequent to the administration of any other antibacterial agent. Box of 2 strips @ 10 capsules. Cefaclor Monohydrate equivalent to 500 mg of Cefaclor. Cefaclor Monohydrate equivalent to 125 mg of Cefaclor. - Otitis media caused by S. pneumoniae, H. influenzae, Staphylococci, and S. pyogenes (group A ?-hemolytic streptococci). - Lower respiratory infections, including pneumonia, caused by S. pneumoniae, H. influenzae, and S. pyogenes (group A ?-hemolytic streptococci). - Upper respiratory infections, including pharyngitis and tonsillitis, caused by S. pyogenes (group A ?-hemolytic streptococci). - Urinary tract infections, including pyelonephritis and cystitis, caused by E. coli, P. mirabilis, Klebsiella sp. and coagulase negative staphylococci. - Skin and skin structure infections caused by Staphylococcus aureus and S. pyogenes (group A ?-hemolytic streptococci). The usual dosage is 250 mg every 8 hours. For bronchitis and pneumonia : 250 mg, 3 times daily. For more severe infections or those caused by less susceptible organisms, doses may be doubled, or as directed by the physician. The usual recommended daily dosage for children is 20 mg/kg/day in divided doses every 8 hours. In more serious infections, otitis media, and infections caused by less susceptible organisms, 40 mg/kg/day are recommended, with a maximum dosage of 1 g/day. - In treatment of ?-hemolytic streptococcal infections, a therapeutic dosage of Cefaclor should be administered for at least 10 days. - Doses of 4 g per day have been administered safely to normal subjects for 28 days, but the total daily dosage should not exceed this amount. - Cefaclor should be given cautiously to penicillin - sensitive patients, because cross - hypersensitivity, including anaphylaxis has been clearly documented. - If an allergic reaction, occurs, the drug discontinued, and the patient should be treated with appropriate agents. - Prolonged use of Cefaclor may result in the overgrowth of nonsusceptible organisms. - It should be prescribed with caution in individuals with a history of gastrointestinal disease, particularly colitis. - A false-positive reaction for Coombs' tests and glucose in the urine may occur. This has been observed with Benedict's and Fehling's solutions. - Caution should be exercised when Cefaclor is administered to pregnant women and nursing mother because the effectiveness of Cefaclor have not been established. - Caution should be exercised when Cefaclor is administered to patients with renal function impairment. Safety and effectiveness of this product for use in infants less than 1 month of age have not been established. Box of 1 vial @ 1 g and aqua pro injection @ 10 ml. - Abdominal infections (peritonitis, infections of the biliary and gastrointestinal tracts). - Infections of the bone, joints and soft tissue. - Renal and urinary tract infections. - Lower and upper respiratory tract injections, particularly pneumonia. - Genital infections including gonorrhoeae. - Peri and post-operative prophylaxis. The usual dose is 1 - 2 g once daily (every 24 hours). In severe infections and in cases in which organism are only moderately sensitive, the daily dosage may be increased to a maximum dose of 4 g daily. A daily dose of 20 - 50 mg/kg body weight not more than 50 mg/kg body weight/day on the account of the immaturity of the infant's enzyme systems. It is not necessary to differentiate between premature and mature infants. Daily dose of 20 - 80 mg/kg body weight. For children weighing ? 50 kg, the normal adult dose can be used. For intravenous administration the doses of 50 mg/kg body weight should be given by infusion for a minimum of 30 minutes. The recommended dosages as for adults. No dosages adjustment is necessary for elderly patients. Depends on the cause of the disease. As with antibiotic therapy in general, administration of Ceftriaxone should be continued for a minimum of 48 to 72 hours after the fever subsides or the bacteria eradication has been obtained. Experimental studies of Ceftriaxone administered in combination aminoglycosides showed that a synergetic effect occurs. This is of particular importance in severe, life-threatening infection due to Pseudomonas aeruginosa. Both drugs must be administrated separately. For the treatment of gonorrhoea (penicillinase and non-penicillinase producting strans), a single intramoscular dose of 250 mg is recommended. To avoid post-operative infections in contaminated or potentially contaminated operations, a single dose of 1 - 2 g/day depending on infection risk, 30 - 90 minutes before the operation is recommended. For colorectal surgery, concurrent (but separate) administration of INTRICEF® and a 5-nitro-imidazole as ordinazole derivative might be considered. In patients with impaired renal function, there is no need to reduce the dosage of INTRICEF® provided liver function is intact. Only in case of pre-terminal renal failure (creatinine clearance < 10 ml per minutes) should the daily dosage be limited to 2 g or less. In patients with liver damage there is no need for the dosage to be reduce provided renal function's intact. In severe renal impairment accompanied by hepatic insufficiency, the plasma concentration of INTRICEF® should be determined at regular intervals and dosage should be adjusted. In patients under going dialysis, no additional supplementary dosing is required following the dialysis. - The used of freshly prepared solution is recommended. These maintain stability at 6 hours at room temperature (25° - 30°C) or 24 hours at temperature 5°C. - Do not use if the color of solution ranges from light yellow to amber. - 1 g of INTRICEF® should be dissolved in 10 ml of aqua pro injection. The solution should be administrated by intravenous injection over 2 - 4 minutes. - In vitro study, antagonistic effects have been observed with the combination of Chloramphenicol and Ceftriaxone. - Coomb's test and galactosaemia test may give false-positive results. - Non-enzymatic methods for glucose determination in urine may give false-positive results. For this reason, urine glucose determination during therapy should be done enzymatically. - Incompatibilities : INTRICEF® should not be mix with calcium - containing solution (such as Hartmann's solution and Ringer's solution), amsacrine, vancomycin, fluconazole and aminoglycoside. - It should be used with caution in patients with anaphylactic shock. - It should be used with caution in neonates with hyperbilirubinemia, especially in premature infants. - Pseudomembranous colitis has resulted in patients who present with diarrhea subsequent to the administration of antibacterial agents. - Superinfections with nonsusceptible microorganism may occur. - The blood count should be regularly monitored during prolonged treatment. - Read the instruction and dosages carefully. - Safety usage in pregnant woman has not been established. - It should be used with caution in nursing mothers. Imipenem Monohydrate equivalent to 500 mg of Anhydrous Imipenem. Cilastatin Sodium equivalent to 500 mg of Cilastatin. Inactive ingredient: Sodium Bicarbonate as a buffer. 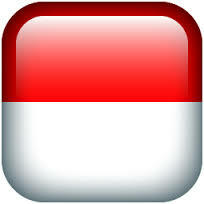 - PELASCAP® i.v. is also indicated for polymicrobial infections including those in which S. pneumoniae (pneumonia, septicemia), Group A ?-hemolytic Streptococcus (skin and skin structure infections), or nonpenicillinase-producing S. aureus is one of the causative organisms. However, monobacterial infections due to these organisms are usually treated with narrower spectrum antibiotics, such as penicillin G.
PELASCAP® i.v. is not indicated for the treatment of central nervous system infections. The total daily dosage and route of administration of PELASCAP® i.v. should be based on the type or severity of infection, consideration of degree of susceptibility of the pathogen(s), renal function and body weight. Doses cited are based on a body weight of 70 kg. The total daily requirement should be given in equally divided doses. The dosage of PELASCAP® i.v. contains 500 mg of Imipenem and 500 mg of Cilastatin. Age does not usually affect the tolerability and efficacy of PELASCAP® i.v. The dosage should be determined by the severity of the infection, the susceptibility of the causative organism(s), the patient's clinical condition, and renal function. INTRAVENOUS ADMINISTRATION: this formulation should not be used intramuscularly. The usual adult daily dosage is 1 - 2 g of PELASCAP® i.v. administered in 3 - 4 equally divided doses (see chart below). In infections due to less sensitive organisms, the daily dose of PELASCAP® i.v. may be increased to a maximum dose of 50 mg/kg body weight/day (or not exceeding 4 g daily). Each 250 mg or 500 mg dose should be given by intravenous infusion over 20 - 30 minutes. Each 1000 mg dose should be infused over 40 - 60 minutes. In patients who develop nausea during infusion, the infusion rate may be slowed. For prophylaxis against post-surgical infections in adults, 1 g of PELASCAP® i.v. should be given intravenously on induction of anaesthesia and 1 g three hours later. For high risk surgery (i.e. colorectal surgery), two additional 0.5 g doses can be given at 8 and 16 hours after induction. As in patients with normal renal function, dosing is based on the severity of infection. The maximum dosage for patients with various degrees of renal functional impairment is shown in the following table. Doses cited are based on a body weight of 70 kg. Proportional reduction in dose administered should be made for patients with lower body weight. Children over 40 kg body weight should receive adult doses with the maximum daily dose should not exceed 2 g.
Clinical data are insufficient to recommend an optimal dose for children under 3 months of age or infants and children with impaired renal function. PELASCAP® i.v. is not recommended for the treatment of meningitis. If meningitis is suspected an appropriate antibiotic should be used. Reconstituted solution is stable for 4 hours at room temperature (25 -30 C) or for 24 hours under refrigeration (2 -8 C). Discard any unused solution after these periods. - Pseudomembranous colitis, reported with virtually all antibiotics, can range from mild to life-threatening in severity. 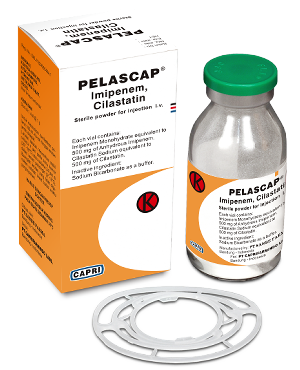 PELASCAP® i.v. should be prescribed with caution in patients with a history of gastrointestinal disease, particularly colitis. Treatment-related diarrhoea should always be considered as a pointer to this diagnosis. While studies indicate that a toxin of Clostridium difficile is one of the primary causes of antibiotic-asociated colitis, other causes should be considered. - SIt should be used with caution in pregnant women and nursing mothers. - Efficacy and tolerability in infants under three months of age have not yet to be established; therefore, PELASCAP® i.v. is not recommended for use below this age. Patients with creatinine clearance of = 5 mL/min/1.73 m2 should not receive PELASCAP® i.v. unless hemodialysis is instituted within 48 hours. - Caution should be exercised upon the partial cross-allergenicity between PELASCAP® i.v. and the other ?-lactam antibiotics, penicillins and cephalosporins. - Severe reactions (anaphylactic shock) may occur in patients receiving therapy with ?-lactams. - Before initiating therapy, careful inquiry should be made concerning previous hypersensitivity reactions to ?-lactam antibiotics. If an allergic reaction occurs, the drug should be discontinued and appropriate measures undertaken. Cefadroxil Monohydrate equivalent to 500 mg of Cefadroxil. Cefadroxil Monohydrate equivalent to 125 mg of Cefadroxil. Cefadroxil Monohydrate equivalent to 250 mg of Cefadroxil. ROKSICAP® is indicated for the treatment of infections caused by susceptible microorganisms, especially for infection caused by Gram-positive bacteria, anaerobic bacteria, and many Gram-negative bacteria such as E. coli, P. mirabilis and Klebsiella. Tonsilitis, pharyngitis, pneumonia, bronchitis, bronchiectasis, pulmonary abscess, empyema, pleuritis, sinusitis, otitis media. Lymphadenitis, abscesses, cellulitis, decubitus ulcer, mastitis, furunculosis, erysipelas. Osteomyelitis, arthritis, septicemia, peritonitis, puerperal sepsis. It is not recommended for upper respiratory-tract infections and otitis media caused by H. influenzae. Treatment should be continued to 2 - 3 days after infection symptoms disappeared. Adults : Usual doses are 1 - 2 g daily, given in two divided doses every 12 hours or once every 24 hours. Uncomplicated lower urinary-tract infections (cystitis) : 1 - 2 g daily as a single dose or in two divided doses. Other urinary-tract infections : 2 g daily in two divided doses. 1 g daily as a single dose or in two divided doses. Mild infections : 1 g daily in two divided doses. Moderate to severe infections : 1 - 2 g daily in two divided doses (500 mg - 1 g every 12 hours). Pharyngitis and tonsillitis caused by gruop A beta-haemolytic streptococci, 1 g daily in two divided doses for 10 days. Age ? 6 years : 500 mg in divided dose, every 12 hours. Age 1 - 6 years : 250 mg in divided dose, every 12 houts. Infants < 1 year of age : 25 mg/kg body weight/day in divided dose, every 12 hours. 25 - 50 mg/kg bodyweight/day in divided dose, every 12 hours. Dizziness, headache, fever, arthralgia, thrombocytopenia, agranulocytosis, and Stevens-Johnson syndrome. Other reactions have included hepatic dysfunction including cholestasis and elevations in serum transaminase, genital pruritus, genital moniliasis, vaginitis, moderate transient neutropenia. It should be used with caution in patients with known histories of penicillin allergy due to the possibility of cross reaction occurs. False positive reactions to Coomb's test and for glucose in the urine using Benedict's of Fehling's solutions, may occur. Prolonged use of Cefadroxil may cause the non-susceptible microorganisms over growth. Safety usage in pregnant women and premature infants have not been established. Pour drinking water until slightly below mark. Close bottle tightly. Hold bottle upside-down and shake until all granules dispersed. Add sufficient drinking water up to mark (60 ml) and shake well. After reconstitution, the suspension is stable for 7 days at room temperature (25° - 30°) or 14 days when stored under refrigeration. - It should be used with caution in patients with known histories of penicillin allergy due to the possibility of cross reaction occurs. - Patients with impaired renal function. - False positive reactions to Coomb's test and for glucose in the urine using Benedict's of Fehling's solutions, may occur. - Prolonged use of Cefadroxil may cause the non-susceptible microorganisms over growth. - Safety usage in pregnant women and premature infants have not been established. Inactive Ingredient : Eucalyptol, Methyl Salicylate, Thymol, Menthol, Sodium Flouride, Sodium Saccharin, Sodium Cylamate, Sodium Benzoate, FD&C Blue No. 1, Barley Mint, Sorbitol, Alcohol 21,85%, Purified Water. Inactive Ingredient : Eucalyptol, Methyl Salicylate, Thymol, Menthol, Sodium Flouride, Sodium Saccharin, Sodium Cylamate, Sodium Benzoate, Eurocert Green Light,, Barley Mint, Sorbitol, Alcohol 21,85%, Purified Water. Prevents mouth ulcers, gingivitis and plaque accumulation. Improves healing from mouth ulcers, prevents gingivitis and plaque accumulation. Only for mouth rinsing, do not swallow. Store at room temperature (25° - 30° C). Box of 1 vial @ 1 g and 1 ampoule water for injection @ 4 ml. Lower respiratory tract infections; urinary tract infections, including uncomplicated gonorrhoea that caused by Neisseria gonorrhoeae including penicillinase producing strains; skin and soft tissue infections, intra-abdominal infections including peritonitis; bone and joints infections; central nerve system infections such as meningitis; septicemia; thypoid fever; gynecologist infections, including : pelvic inflammatory disease, endometritis, pelvic cellulitis; perioperative prophylaxis. Dose, usage and frequency of administration depend on infection, bacterial sensitivity, and patient's conditions (see dosage table). Therapy may be started before the result of sensitivity test is known. - May be given TAXECAP® 1 g every 12 hours. - In severe infection, dose may be raised until maximum 12 g per day. - If daily dose is 4 g, the injection may be given twice every 12 hours. - If higher dose is necessary, the injection may be given with 6 - 8 hours interval. In patient with creatinine clearance <20 ml/minutes, maintaining doses should be reduced until half of normal doses. Doses should be depend on the sensitivity of the causative bacteria and infection level. 1 - 2 g of TAXECAP® should be given about 30 - 90 minutes prior to surgery. - 0 - 1 weeks age : 50 mg/kg bodyweight every 12 hours i.v. - 1 - 4 weeks age : 50 mg/kg bodyweight every 8 hours i.v. - For the treatment of uncomplicated gonorrhoea, 1 g of TAXECAP® i.m may be given. - For infections that are caused by less sensitive bacteria, dose may be increased. - The presence oh syphillis infection in patients must be checked before the treatment initiated. - Depends on the risk of infection, the same dose may be repeatable. - Body weight < 50 kg : 50 - 180 mg/kg body weight divided into 4 - 6 equal doses. - Body weight > 50 kg : adult doses should be taken. - Depend on the patient's response. - Treatment should be continued at least 48 - 72 hours after the patient defervesces or after evidence of bacterial eradication has been obtained. - Infections caused by group A beta-hemolytic streptococci need minimum 10 days of treatment. 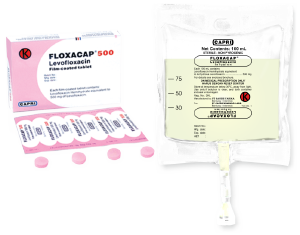 TAXECAP® may administered intravenously or intramuscularly. 1 g of TAXECAP® dry injection dissolved in 4 ml water for injection, shake carefully during dissolving, inject over 3 - 5 minutes straight to vein or distal part from the clamped infusion hose. 1 g of TAXECAP® dry injection dissolved in 4 ml water for injection, inject deeply at gluteus muscle. To prevent pain because of the intramuscular injection, dissolve 1 g of TAXECAP® in 4 ml lidocaine 1 %. - Only fresh reconstituted of TAXECAP® should be used. - Keep the solution in temperature below 25°C not more than 24 hours or for 10 days at 5°C. - Do not use if the solution is cloudy or contains precipitate. - It should be used with caution in patients with gastrointestinal disturbances history, especially colitis. - In patients with hypersensitivity to penicillin, cross hypersensitivity may occur. - Cefotaxime Sodium should not be used in pregnancy, especially at first three semester, except there is any urgent indication. - It should be used with caution in nursing mothers, since Cefotaxime Sodium is excreted in breast milk. - In patient where amoniglycoside therapy is concomitant with Cefotaxime, renal function test should be taken. - Blood cells count should be taken in patient that is already treated for more than 10 days and the treatment should be discontinued when neutropenia occurs. - Long term treatment with antibiotic may cause a resistant microorganism growth, therefore the patient's condition should be checked in several interval times. - Prolonged used Cefotaxime may cause non-susceptible microorganism overgrowth.